Valves are used to regulate and redirect liquid flows. Alfa Laval’s sanitary mix-proof valves, which prevent product contamination from other non-sanitary fluids, are delivered as complete solutions and complemented by intelligent control equipment. Butterfly valves provide gentle treatment of low and medium viscosity products. Seat valves are characterized by a modular design with only a few movable parts which makes them highly reliable and hygienic. Aseptic diaphragm valves are ideally suited for use in sterile and ultra-hygienic processes, especially for the pharmaceutical industries. The Alfa Laval range of pumps covers every need for gentle, precision pumping of all kinds of fluids of all viscosities in hygienic applications. The centrifugal pumps combine high efficiency with careful product treatment. The positive displacement pumps can be found in virtually every industry where gentle, sanitary processing of viscous products is required. 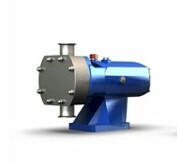 The liquid ring pumps are designed for pumping liquids containing air or gas. The need to separate smaller and smaller particles from each other within a flow stream is becoming increasingly important in process industries. Decanter centrifuges are normally based on horizontal separation technology and work at slower speeds. Air heat exchangers feature excellent heat transfer with minimized fluid volume and low power consumption. for commercial as well as industrial cooling, air-conditioning and refrigeration. The range of air-cooled condensers is designed for air-conditioning and refrigeration duties. Dry coolers are used for heavy-duty applications and the range of unit coolers is suitable for direct cooling of rooms.